If you are looking into a cheaper alternative to shade sails, you have probably considered installing an outdoor umbrella. At a glance, umbrellas can seem to be a practical option, especially if you have a limited budget. But will it really give you value for your money? 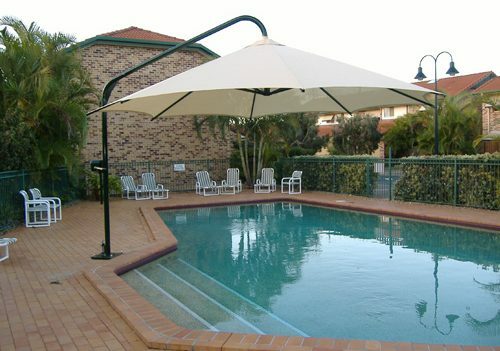 Unlike shade sails, the coverage offered by outdoor umbrellas are rather limited based on its size and area. If you are looking to provide shade to a large amount of space, shade sails present a better option, especially for pools, car parks and other commercial spaces. In general, outdoor umbrellas come in different colours and designs. However, if you prefer to have a wider selection of material, colour and patterns, shade sails have better chance of offering you a design to complement your existing exterior design. With its versatility, no wonder shade sails are widely preferred option among residential owners. Australia is quite known for its temperamental weather. You will want an outdoor shade will be able to withstand strong winds and heavy rains. At the same time, you want one that can provide good sun protection from the harmful UV rays. An outdoor umbrella will not be able to give you the same level of protection. Shade sails often come with at the very least 10 years warranty and some even offer a lifetime warranty, which should give a clear idea the longevity of its material. So while you may think you will initially save on the purchase of an outdoor umbrella, if you want great value for your money and durability for your investment, then you should seriously consider getting a shade sail instead.